The FREND Group is a national charitable health clinic that dedicates its financial resources and clinical expertise to improve the quality of life for people in need since 1994. Free "Cognitive Behavior Education and Clinical Hypnotherapeutic Treatment Program"
Our proprietary program is based on research at nationally respected institutions like Stanford, Harvard, UCLA, John Hopkins and Mayo Clinic. It is the most advanced, effective, and safest approach we know of today for behavior modification, stress reduction and stress-related issues such as weight, smoking, pain, insomnia and more. Our program is a prescription for the mind; similar to a medical doctor's prescription for the body. It pays all professional fees and ancillary costs for providing an effective seminar/clinic. It is free to participating organizations and all their personnel are invited to attend free (With your organization's approval, employees' family, 12 years old or older may also attend free). Our Service Grant is a gift of life to organizations that want to help employees lead healthier, happier more productive lives. Organizations also benefit from a healthier, happier workforce that can lead to a more profitable bottom line. 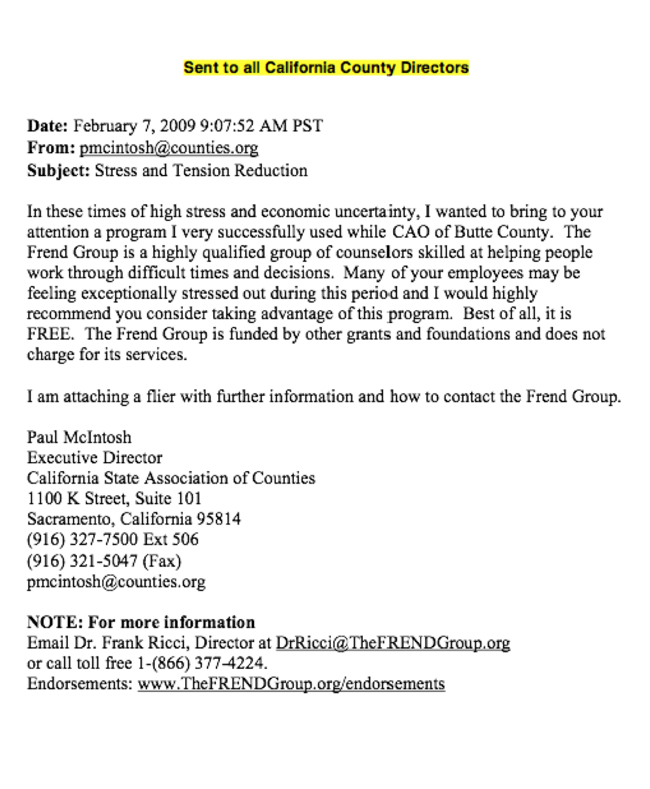 FREND has awarded Service Grants to over 200 deserving organizations nationally. Major corporations, government agencies, law enforcement, fire-fighters, health organizations and professional associations have all taken advantage of our proprietary program. Our proven-effective program is designed to eliminate stress, excess weight, smoking, pain, insomnia and improve general health. Attendees learn clinically proven methods that can empower and dramatically improve their health by applying the latest in motivational psychology. Employees see first-hand how this special presentation is educational, inspirational and a fascinating adventure into how to utilize their powerful mind to help improve the quality of their life. It is presented in terms that are easy to understand and adopt, to enhance personal growth and improve health. Participants gain valuable insight and awareness into why they make decisions that adversely affect their health and learn proven effective skills that can free them from past negative conditioning. In addition, with your organization's participation, we will gift every employee that attends a free Stress Reduction Audio CD Program clinically proven to significantly reduce stress quickly and safely (No known negative side effects). Attendees acquire a new level of confidence in their innate abilities, an increased feeling of self-worth and an inner strength that remains with them long term. Since our inception in 1994, we've enjoyed virtually a 100% approval from organizations we have served. Organizations like The American Cancer Society, The California State Association of Counties, General Dynamics the California Association of Highway Patrolmen and California Police Chiefs Association to name a few. 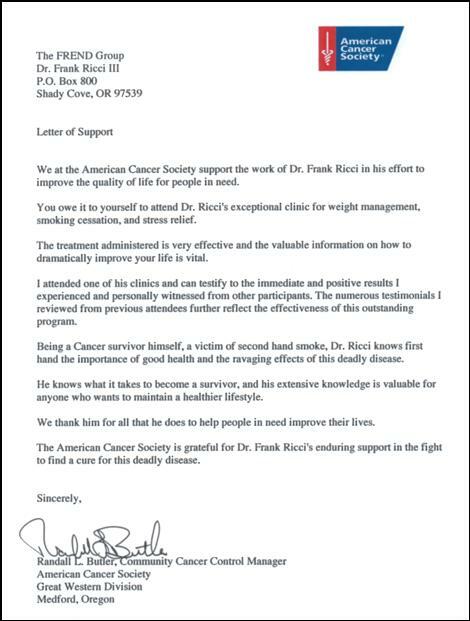 Our Director, Dr. Frank Ricci, co-founded The FREND Group after he contracted Cancer from second-hand smoke (He did not smoke). His original mission was to help smokers quit. 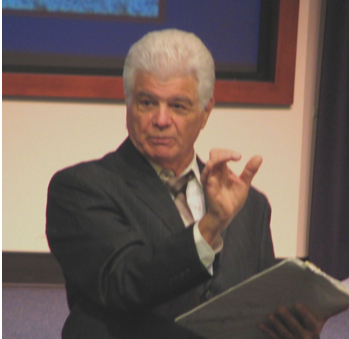 After a quarter century of dedication to improving the quality of life for people in need, Dr. Ricci is now a sought-after inspirational clinical speaker and nationally respected leader in behavior modification with over six thousand events to his credit. Frank also received a Humanitarian Award for his compassionate work with Down Syndrome children. The FREND Group also dedicates a portion of their time and treasure to charities like the American Cancer Society and research to combat chronic stress, obesity, smoking and addictive behavior. Please write in the body of your email: "Attention Dr. Ricci: We would like to learn more about your "Service Grant" and free seminar/clinic for our employees" (Please include your name, title and email address. Attendees leave refreshed, relaxed, motivated and self-confident. They learn how to take charge of their health and look forward to improving the quality of their life. Stressed attendees say, stress and tension was eliminated or significantly reduced during the session and remained so long afterward. Stress-induced headaches and muscle pain disappeared and now have new knowledge and skills to control stress and stress-related issues. Overweight people report, typically losing 8 to 35 pounds naturally within the first six weeks with no fad or starvation diets. Others report losing 50 to 75 pounds or more over an extended period of time (one client reported losing 125 pounds). Smokers and chewers report quitting with no negative withdrawal symptoms and no weight gain. One attendee recently wrote that she quit two packs of cigarettes per day (Three on weekends). She feels much healthier now and delighted that she saves over $400 every month. What's more, she achieved this after attending just one two-hour session. Others say they no longer suffer from insomnia, stopped drinking excessive alcohol, biting their fingernails. They maintain a more positive attitude toward themselves, family and co-workers. Clinical reinforcement audio programs are available to attendees by request. Used as directed, these programs enhance success. They are proven safe and effective and attendees can use them anytime in the privacy of their home plus share them with loved ones in need, twelve years old or older. Dr. Ricci's seminar/clinics are not just clinical, all attendees receive free behavioral modification treatment and a fascinating life improvement education referred to as the "The wow factor". Attendees can experience immediate positive results. When attendees arrive they may select any unoccupied seat (Hearing impaired should sit as close to the speaker as possible), they receive a brochure which provides complete information about what to expect during the presentation. FREND’s seminar/clinics are conducted by a clinician with extensive experience in mind/body wellness and behavior modification. The sessions consist of a comprehensive and priceless education on how the mind influences the body to create either a healthy (aka Success) or an unhealthy (aka Failure) lifestyle. Positive psychology, guided imagery and progressive relaxation are designed to naturally and effectively modify behavior - Many attendees experience immediate dramatic results. Includes a comprehensive and fascinating education on mind/body wellness. How the mind influences the body to create a healthy or unhealthy lifestyle. Our thoughts have direct influence over our body and FREND’s clinically based program shows people how to effectively modify their belief system to improve their life and overall health. Attendees learn about the "Theory of the Mind", The Pain/Pleasure Principle, Progressive Relaxation, Positive Visualization and how the link between cause and effect of stress and anxiety can lead to negative behavior such as smoking, excess weight, pain, insomnia, poor overall health and in some cases premature death. The Spirit is the outward expression of how someone feels and how the Mind and Body are working together. All three, Mind, Body and Spirit work as one, you cannot affect one without affecting the others. That is why this program is geared to help improve the whole person and enjoys an exceptionally high success rate. Attendees then experience the first of two enjoyable relaxation techniques designed to easily eliminate stress and associated pain in minutes. They also learn about advanced programs they and their family can use to achieve and maintain a positive and stress-free lifestyle. In addition, they receive a fascinating education on the "Theory of the Mind" including the roles the conscious and subconscious minds play in ones life. How the mind influences the body to create either a healthy or an unhealthy lifestyle, how we create addictive behavior, positive psychology, guided imagery, the comfort zone, various states we enter during our normal day such as the beta, alpha, theta and delta ranges and what they mean, and progressive relaxation techniques designed to naturally and comfortably eliminate stress and tension and stress-induced pain. Many people notice that stress, tension and stress-induced pain they had when they arrived (e.g. headache and muscle ache) have dramatically reduced or completely disappeared. Many attendees report having pain daily for months and years only to find it gone after just one fifteen minute treatment. After a quarter of a century helping tens of thousand of employees nationally improve their lives, those who arrive as skeptics become firm believers. During the intermission most people are amazed at how relaxed they feel. The intermission usually lasts from 20 to 30 minutes. Those with stressful jobs experience the most dramatic relief (e.g. Law Enforcement). Participants learn about one of the most addictive substances known and how manufacturers use this substance to manipulate them into buying their unhealthy products. Smokers learn how they can quit smoking with no weight gain and no negative withdrawals - One attendee who quit two packs of cigarettes per day and three on the weekend, said she is much healthier plus saves over $400 each month. Overweight people learn how they can lose all the excess weight they want naturally, with no fad or starvation diets. Many attendees also enjoy additional unexpected benefits other than stress reduction, smoking cessation or weight loss. The speaker also focuses on the relationship between how they think and what they eat. For example, how sugar plays a key role in the thought process and its relationship to excess weight and smoking. How smoking is a stimulant and not a sedative, as most smokers incorrectly believe. Dr. Frank Ricci is a Cancer survivor, who contracted it from second-hand smoke so he knows first-hand what it takes to avoid and survive this deadly disease. He emphasizes one of the major components in fighting Cancer and it is proper nutrition and the defensive role it plays. The American Cancer Society supports The FREND Group's program and we share their guidelines to eating healthier with our clients. Our reinforcement program helps people look forward to and enjoy drinking eight wonderful glasses of water per day assisting in weight loss. 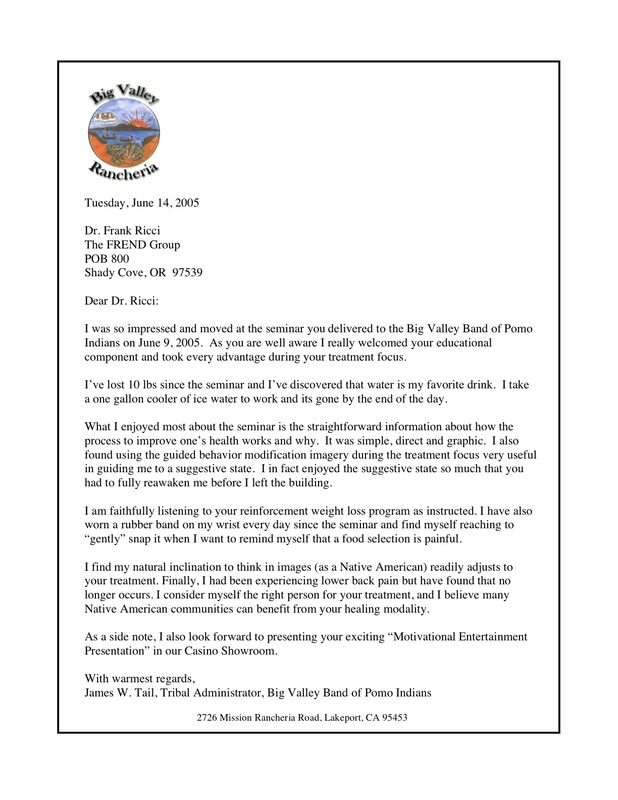 Frank shares how the Administrator of the Big Valley Band of Pomo Indian Tribe easily lost ten pounds with one simple instruction. He then guides attendees through their second reinforcement stress reduction technique that can help them also quit smoking and/or lose excess weight naturally including stress-related pain. Participants find this experience extremely beneficial. Many feel as if they just had eight hours of refreshing sleep. Many contact us later and say, that night they had one of the most peaceful nights sleep they ever had. Attendees look forward to taking charge of their health and improving the quality of your life. They leave feeling positive about themself and the treatment they received. Many attendees feel like a new person, more positive and look forward to eating healthier and having freedom from stress and stress-related issues.